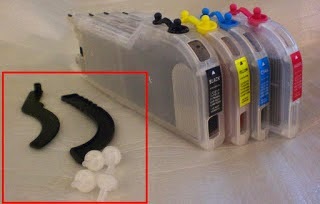 Learn here how to install a system printer cartridges Brother MFC-240C with the following steps. Brother printers are the best printers to install continuous ink system, are easy to installation, we get a good quality and performance. We can not really distinguish between ink system and refillable ink cartridges tool that adapts to this printer to save a lot of money when printing. This can install anyone even with little knowledge of printers, only needing to make an adaptation of a sensor that indicates when the printer has a lid that provides access to the closed cartridge. Buy ink system for Epson printer costs between 30-60 dollars, normally achieved via Chinese manufacturers, we must work perfectly just be careful with the type of ink used. We can fill these cartridges with ease, only recommended not using syringe and needle and uncover the entire cartridge when we do, remove both the plug hole where the ink and pulls air through which the cartridge is placed. If the printer is new recommended is the time to put it to work for first time use cartridges that brings the printer, then put replacement cartridges and continuous ink system with their respective colors. This type of system usually brings a tool we use to tell the printer that the door giving access to the cartridges is closed, it is recommended to look at the cover to check where the function does.